How do you improve on perfection? That is the question the Foodamentals team was tasked with over the last couple of weekend. We have been wracking our collective brains together trying to figure out how to take the San Francisco Mission burrito to the next level. It is kind of like asking God to improve upon Adriana Lima. Damn near impossible. For the uninitiated, the Mission burrito is a San Francisco icon that has been beloved by decades from people all around the world. Native San Franciscans are especially proud of the unique, yet familiar spin on the venerable burrito that has now seen its popularity replicated all across the United States. Popularized in the 1960s, Mission burritos were developed by Mexican immigrants in the Mission district(duh) and are distinct in their gargantuan size and their generous portions of rice. Through the years, the originators of the first Mission burrito has been debated and even today, no one quite knows where the term and original recipe came from. But who cares. In the end, given the plethora of choices we have in San Francisco, we are all winners. Although the Mission burrito is as close to perfection as possible, we still wanted to try and challenge the status quo by making it even better. Hence, we thought to ourselves… what can we add to a Mission burrito to make it all Super Saiyan-jin? 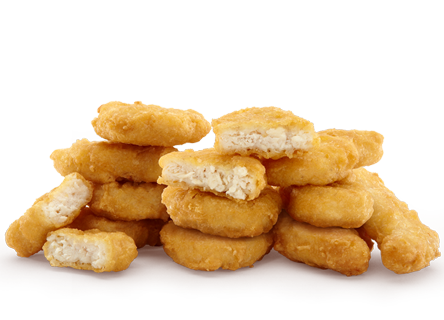 Yes, chicken McNuggets. And why not? We all like Mission burritos and everyone loves chicken mcnuggets(despite the lack of real chicken in any of those nuggets) why wouldn’t the combination of the two be absolute food bliss? It just makes too much sense to not, at least, try it. So knowing that, we proceeded to procure a beautiful, perfect, carne asada “super” burrito from El Farolito located at the corner of Mission and 24th street. The “super” burrito was packed with fresh beans, rice, cilantro, cheese and oh-so-creamy avocado. The carne asada was beautifully grilled and tasted like unicorn’s teardrops on a bright sunny day. The creamy and fresh avocado complimented the rice and beans by providing a smooth texture that provided a nice viscous layer that coated the sides of your mouth. Oh man, I’m drooling thinking about it. Anyhow, we also picked up a box of 20 piece McNuggets and after some deliberation, we decided we could test out this McNugget+Mission Burrito frankenfood in two different orientations. Scenario 1: Put the chicken nugget into the burrito. By putting the nugget into the burrito, it guarantees that you will get both nugget meat and burrito filling all in the same bite. And yes, you do get both in every bite. However, the McNugget tends to overwhelm the rest of the burrito in both its texture and taste. Usually, every time I eat a McNugget, it tastes like I just bit into a metal grate and true to form, this “tin” flavor overpowers whatever deliciousness the burrito originally had. I am assuming the tin flavor sets in because the oil in the fryers don’t get changed enough. But every bite I took I was greeted with a mouth full of oil(which I assume came from the McNuggets). The verdict here… I’m mixed on this, wasn’t quite the awesomeness I expected but was not terrible. The thesis here is that the taste of the chicken nugget will come before the taste of the burrito. Therefore, you will get more fried chicken flavor followed up with some fantastic burrito taste. Sadly, this wasn’t the case. Trying to be overly ambitious and showing an entire McNugget into your mouth leaves very little room for the burrito. If anything, this really became “mouthful of McNugget with a smidgen of tortilla.” Not exactly optimal. In the end, maybe Foodamentals was trying to be too ambitious. Sometimes perfection just doesn’t need to be messed with and in this case, that seems to ring true. I’ll leave you with this. The secret to making the Mission burrito better than it already is… is to leave it alone. Yes, don’t add anything to it, its already perfect as it is. PERFECTLY GOOD WATERMELONS WASTED TO MAKE WATERMELON ART.